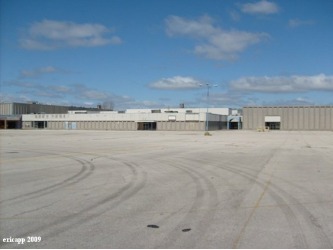 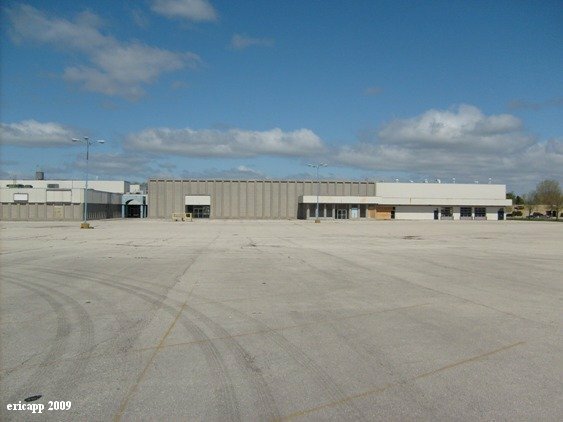 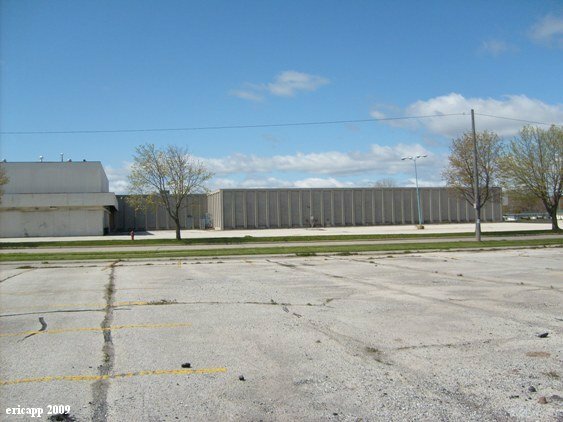 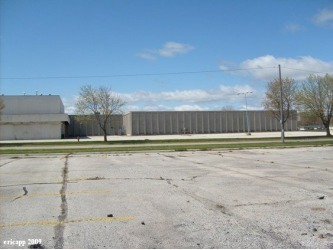 The Mid-Cities Mall in Manitowoc, WI, opened in the late 1960s. 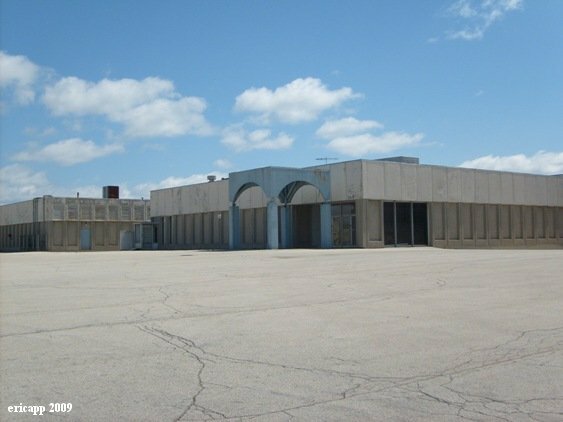 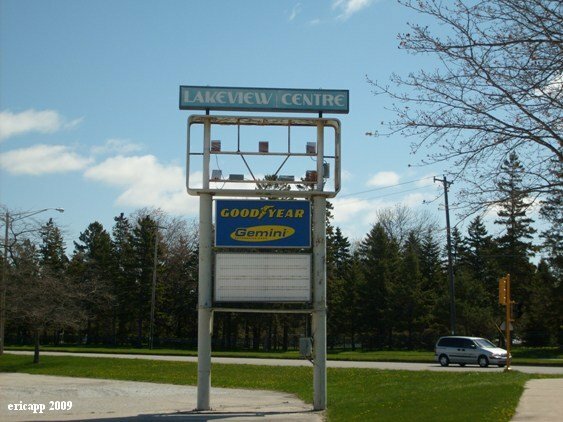 In the 1980s, the mall started to fall on hard times, and its name was changed to Lakeview Centre; the 1990s fared even worse. 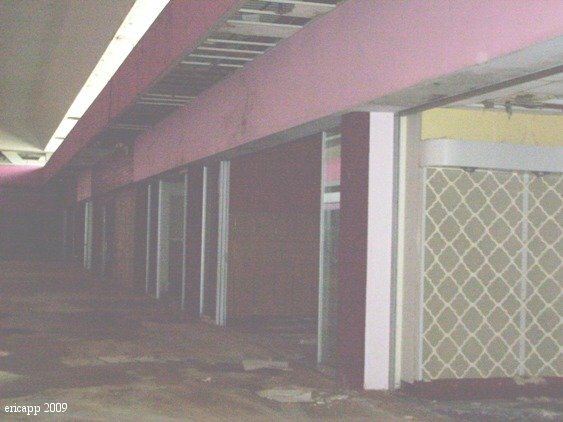 The mall finally closed in 2000, with the exception of one of the anchors - JCPenney. 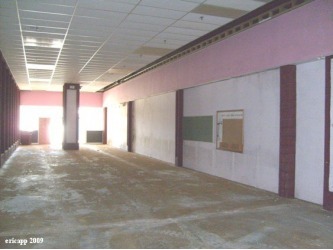 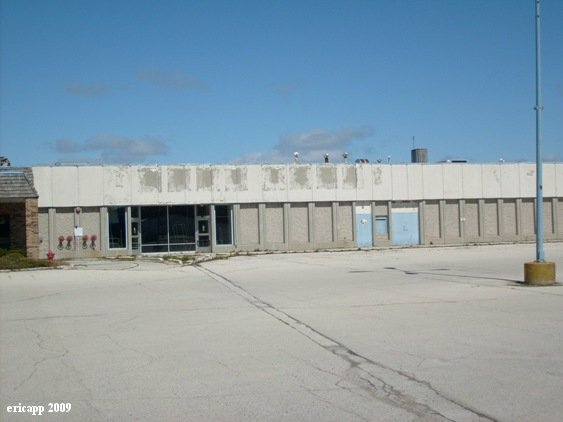 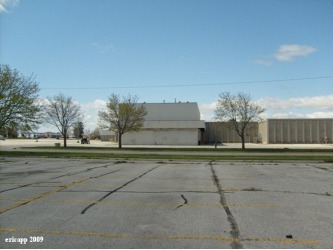 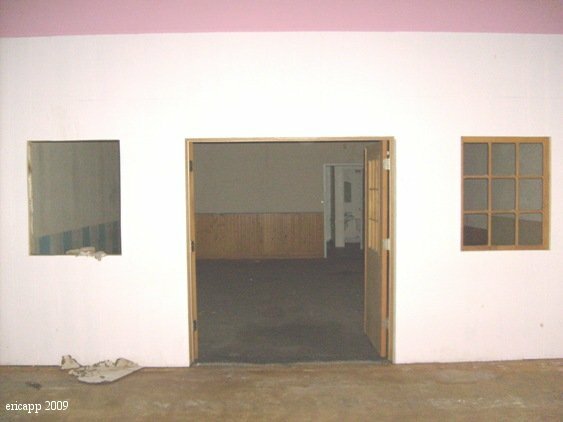 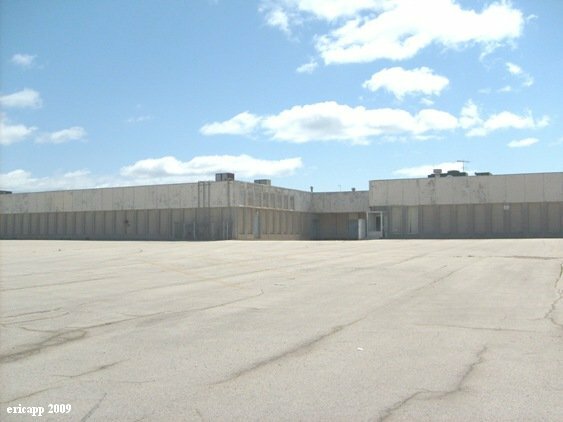 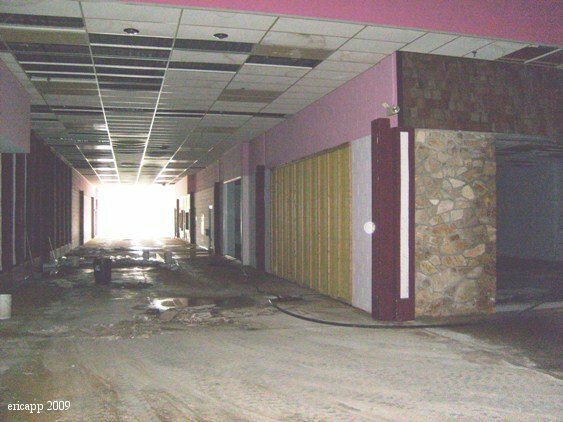 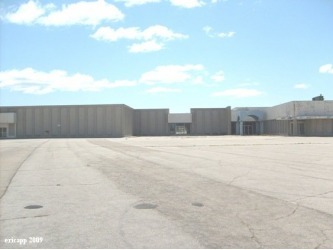 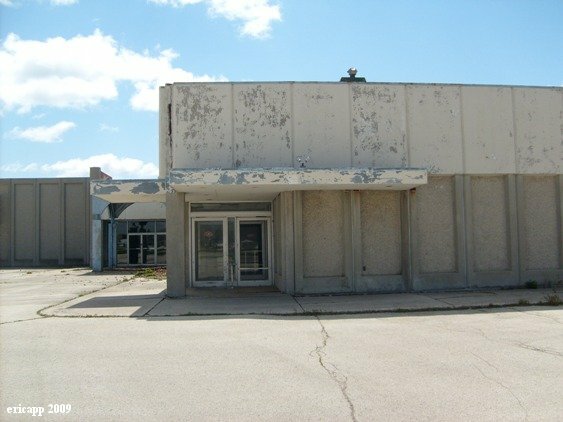 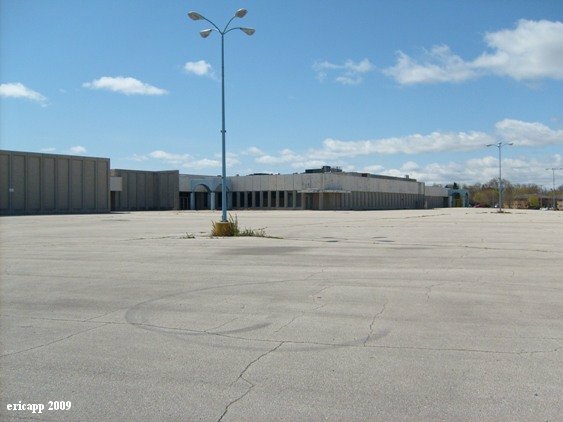 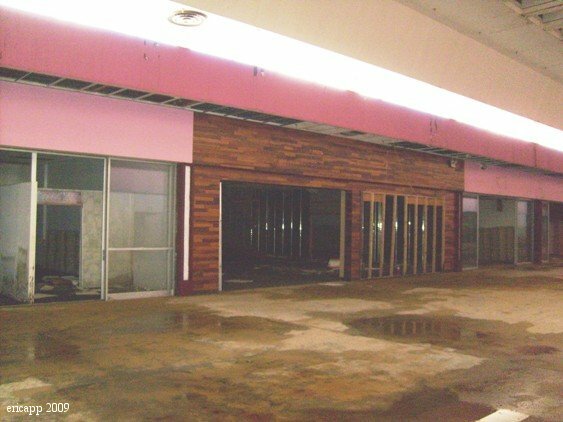 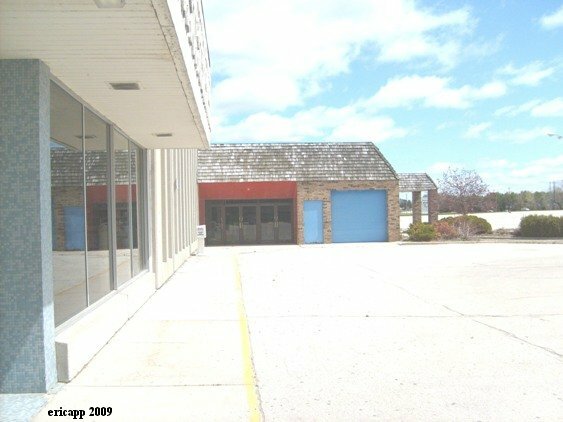 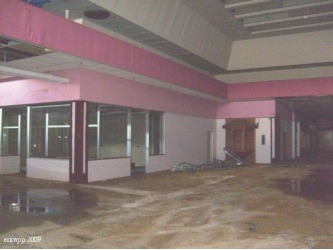 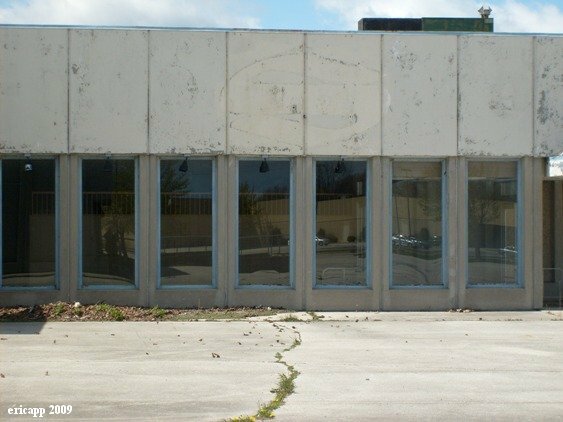 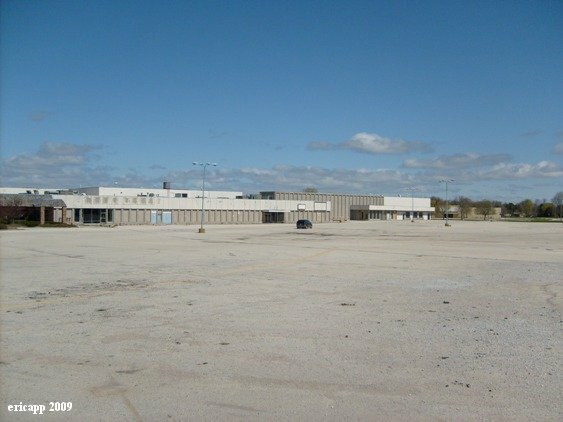 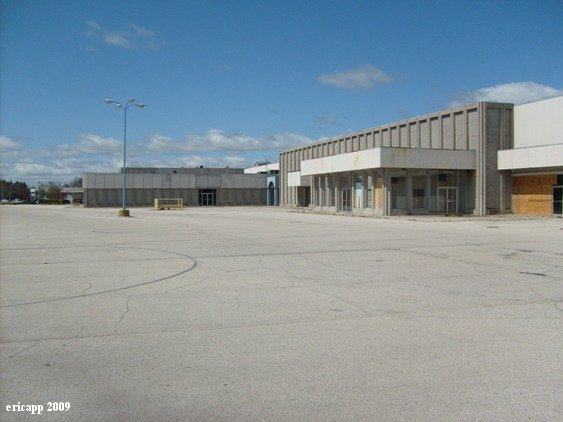 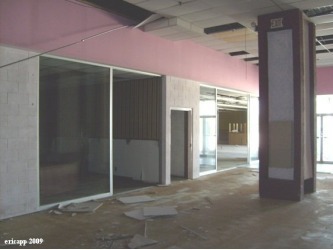 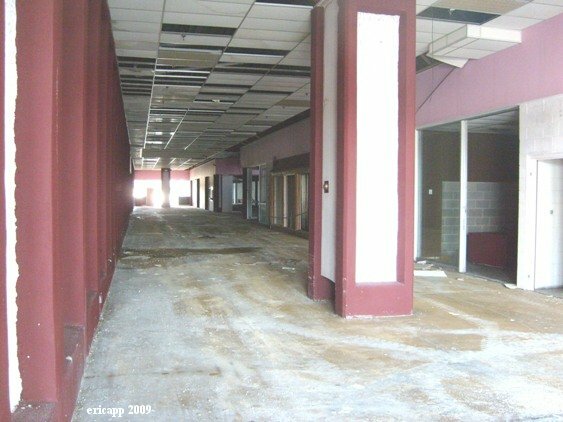 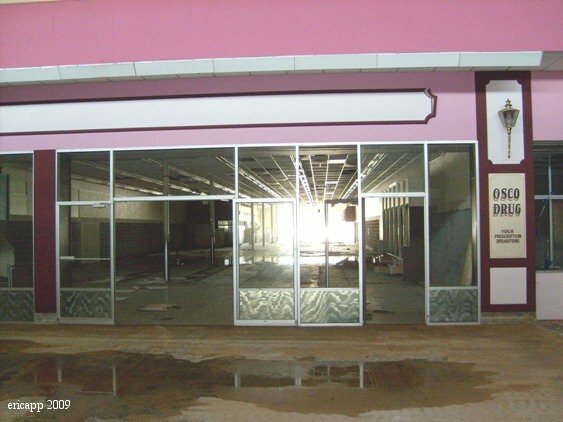 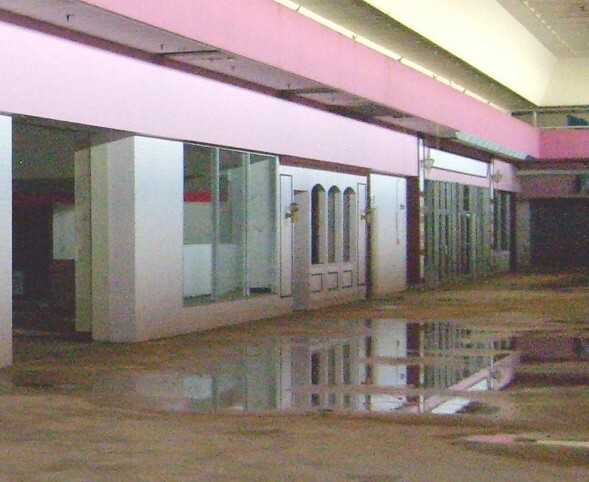 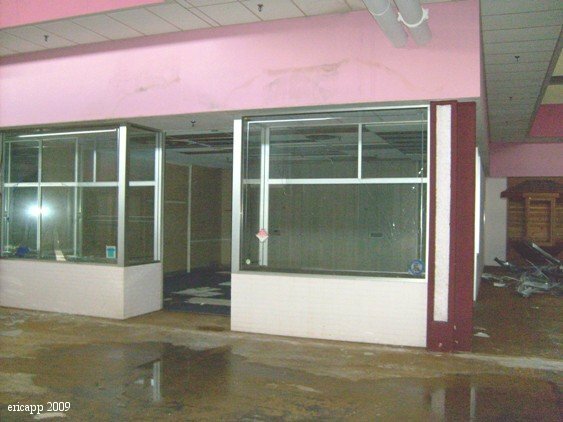 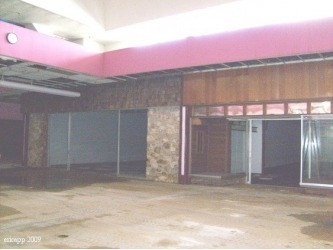 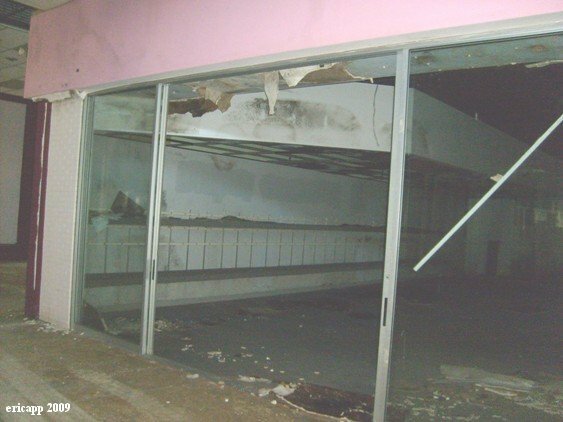 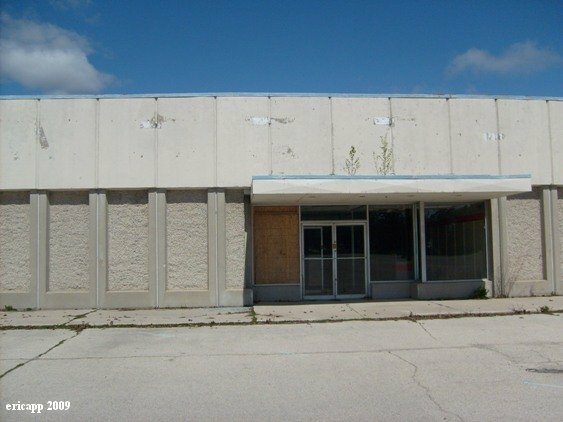 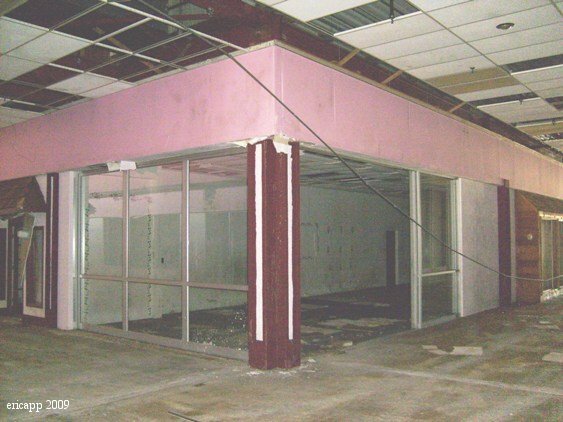 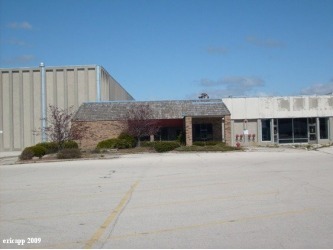 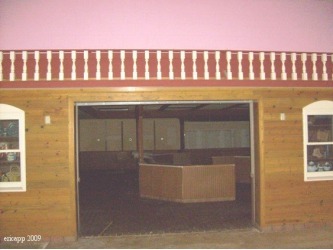 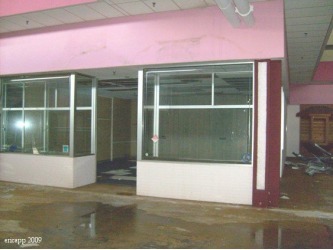 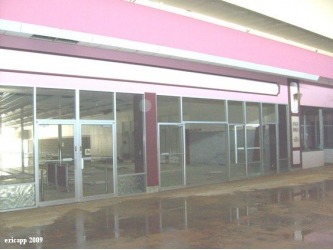 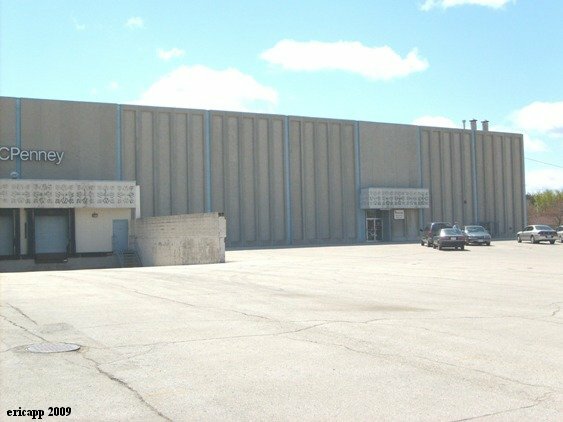 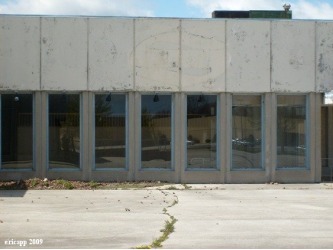 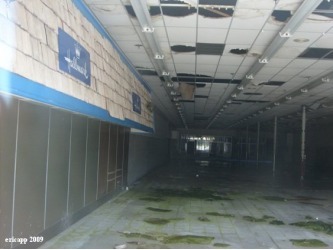 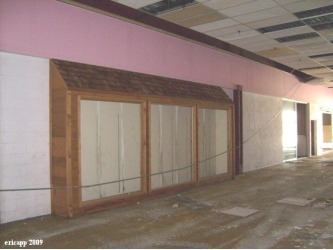 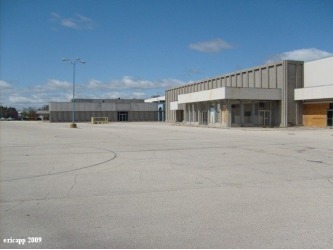 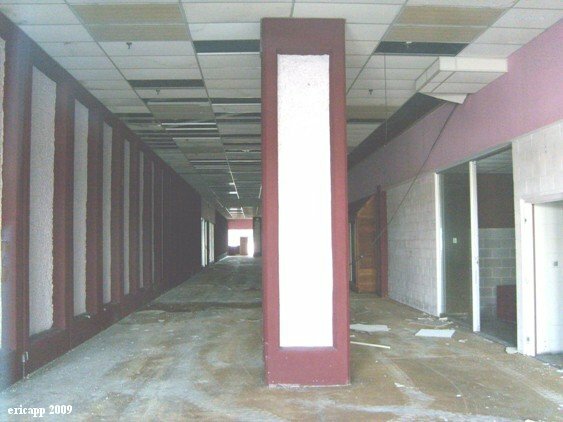 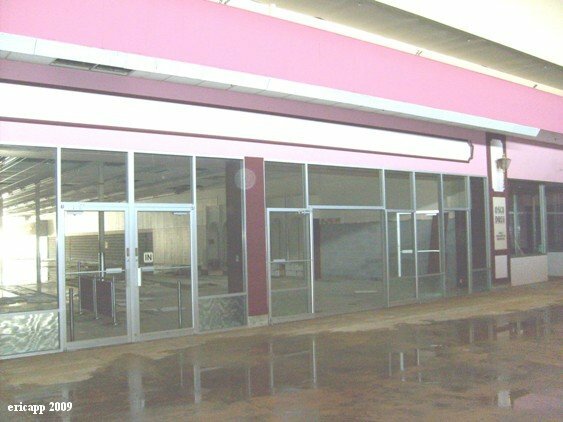 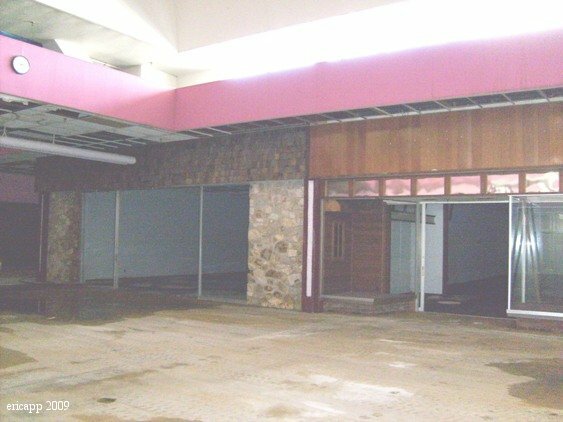 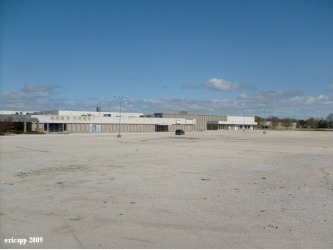 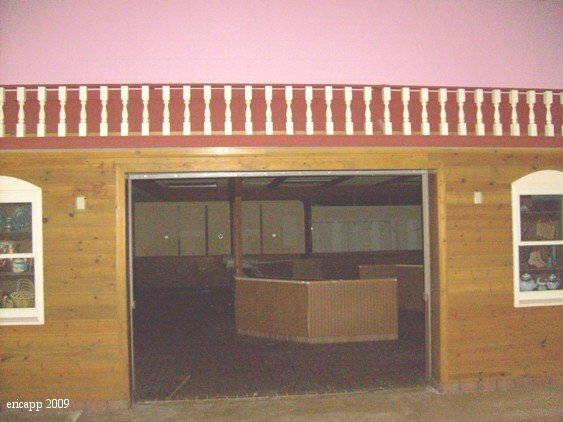 The pictures below were taken of the abandoned mall in the spring of 2009. 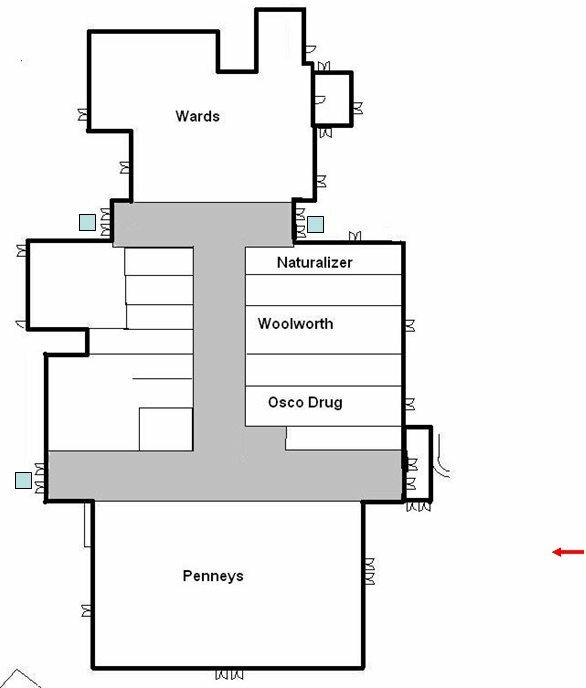 Next to each picture is a diagram of the mall; a red arrow on the diagram points to the area of the mall that is in that particular photo. 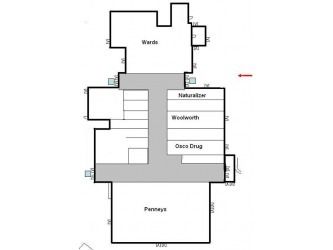 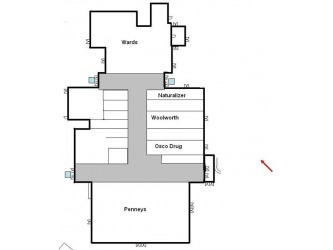 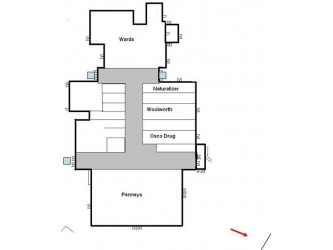 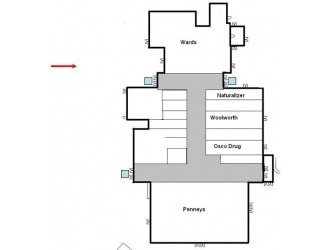 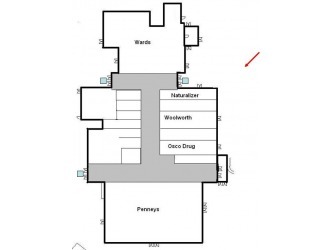 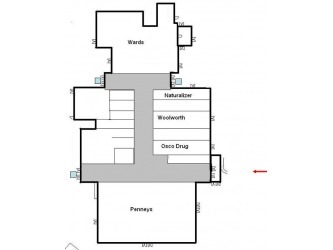 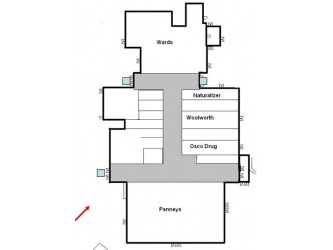 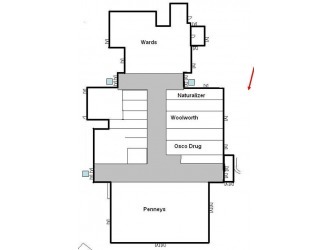 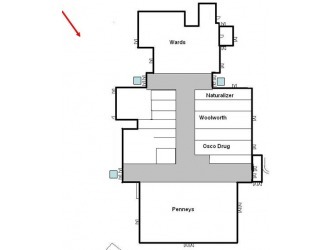 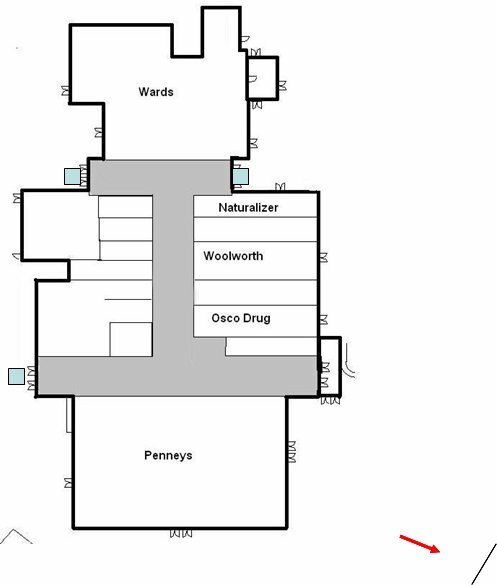 The diagram is not to scale, it is just meant to give you an idea of where the photo was taken. 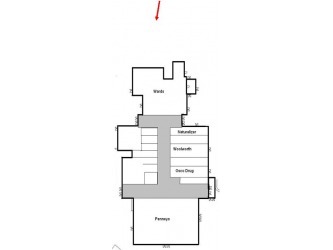 Click on each photo and diagram to enlarge. 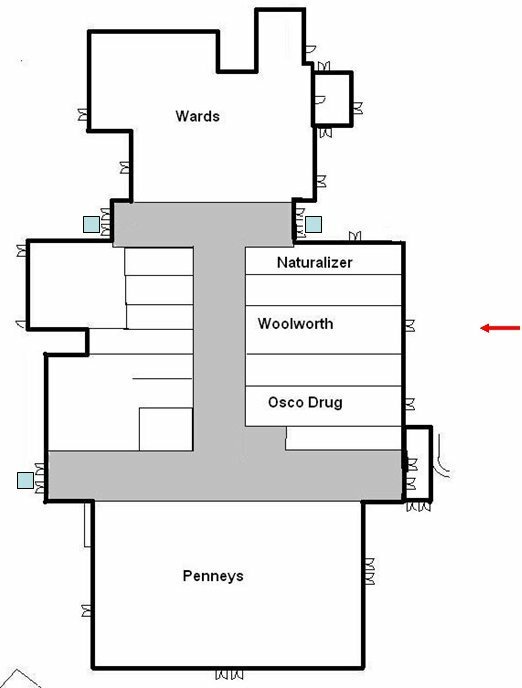 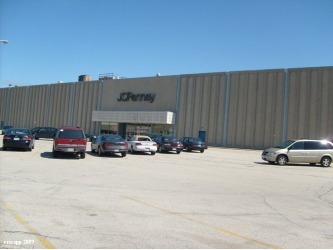 Update: JCPenney closed in January 2011, leaving the entire mall vacant. The mall's name was changed from Mid-Cities Mall to Lakeview Centre in the 1980s. 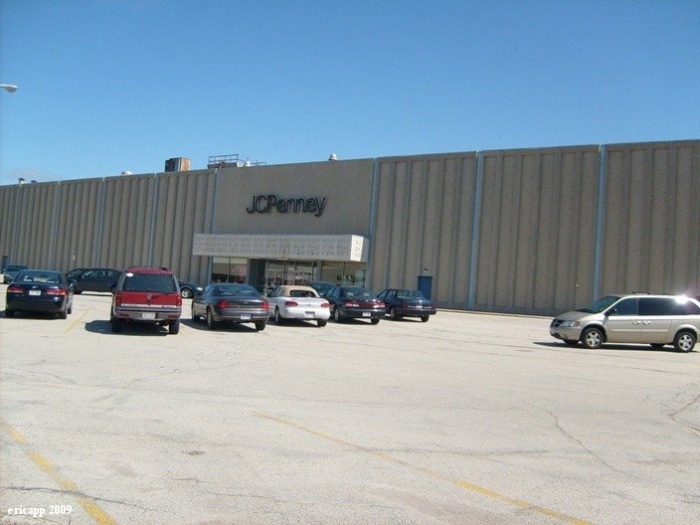 The only two tenants left are JCPenney, which is one of the original anchors, and Goodyear Tire Center, which is a standalone auto service center near JCPenneys. 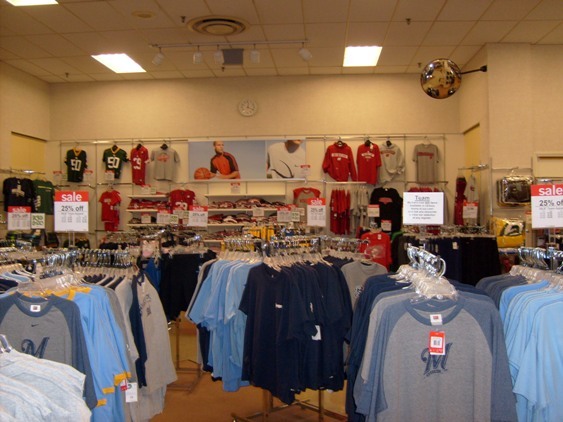 Update: JCPenney closed in January 2011. The east side of the mall. 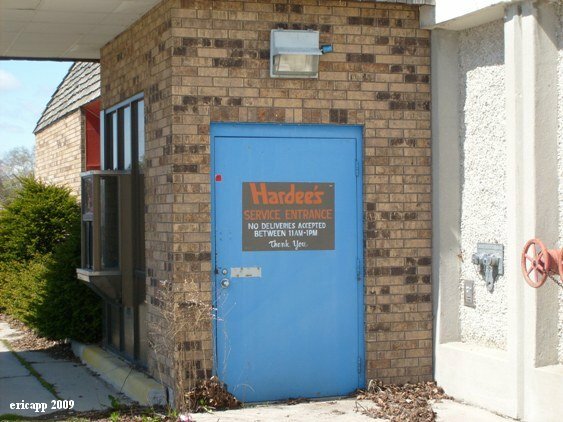 Hardee's and its drive-thru were added in the 1980s; it closed in the 90s. The exterior of the Osco Drug store. 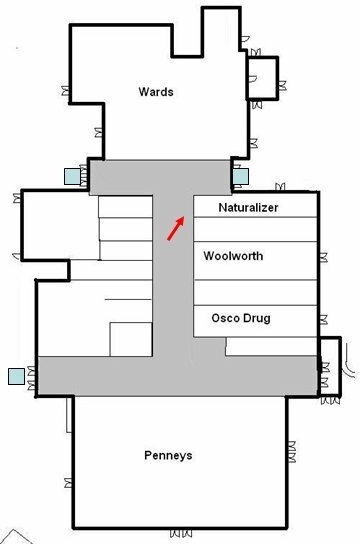 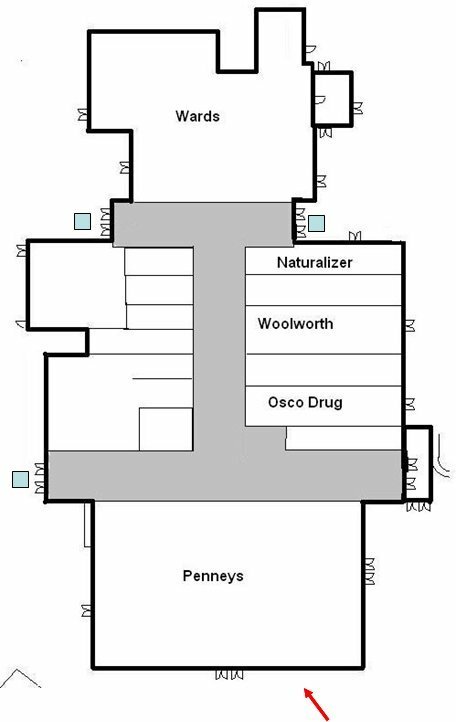 The interior of the Osco Drug store. The ceiling tiles on the floor have turned green. 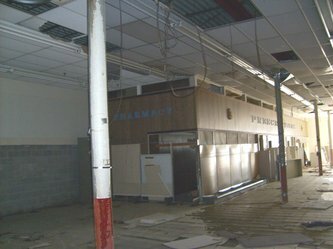 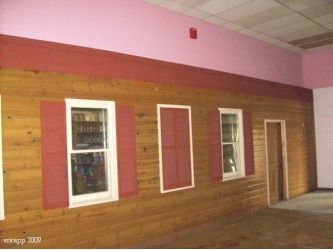 More interior photos of Osco Drug. 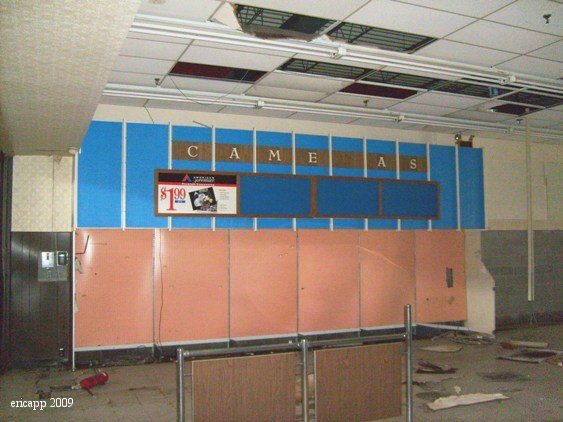 Where did the "R" in CAMERAS go? 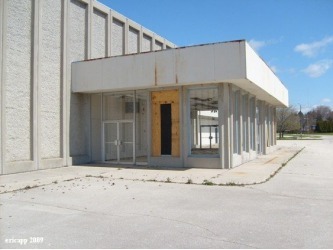 The exterior of the Woolworth store. Notice the plant or tree that is growing out of the door's overhang. 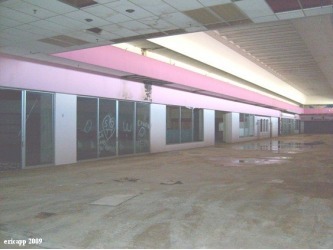 The east side of the abandoned mall. 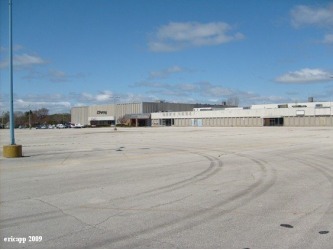 Plenty of room in the spacious parking lot. Under the blue canopy and facing one of the mall's east-side entrances. 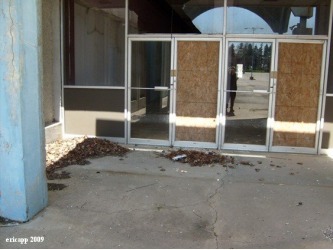 Dead leaf pile in front of the doors - half of which of had their glass broken out. 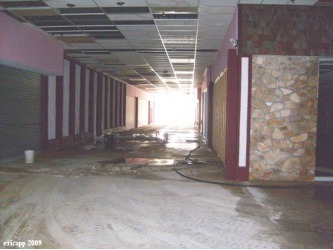 A peek into the mall's corridor through the entrance door. 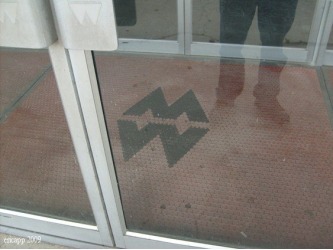 Montgomery Wards logo on the door handles and on the floor mat. How did the boarded-up window break in the pic above? 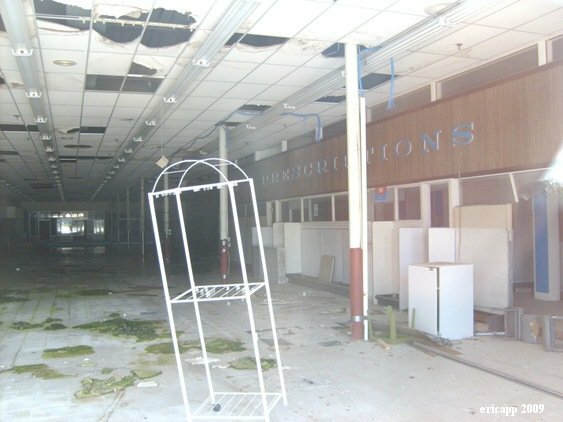 A bird crashed through it in the spring of 2007. The east side of the Montgomery Wards store. 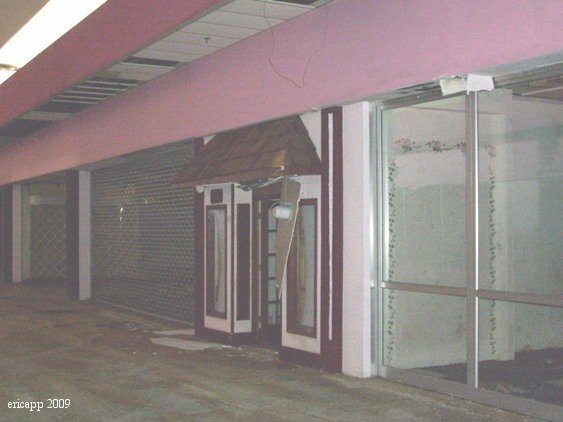 It was the first nail in the mall's coffin when this store closed in the early 1980s. The north side of the mall. 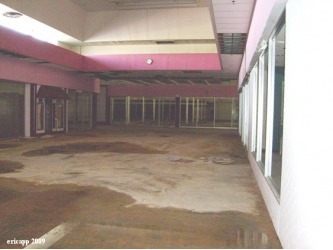 The northwest corner of the mall. 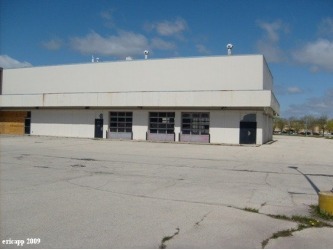 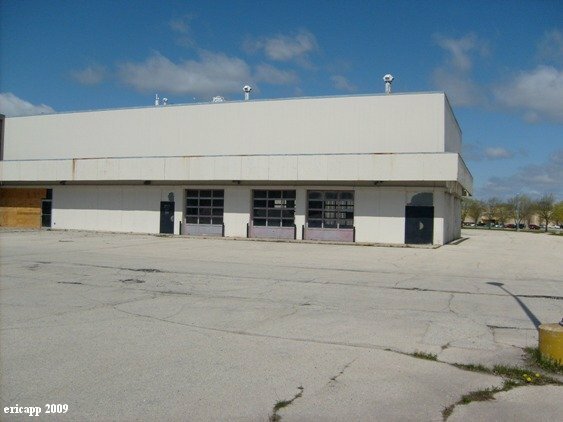 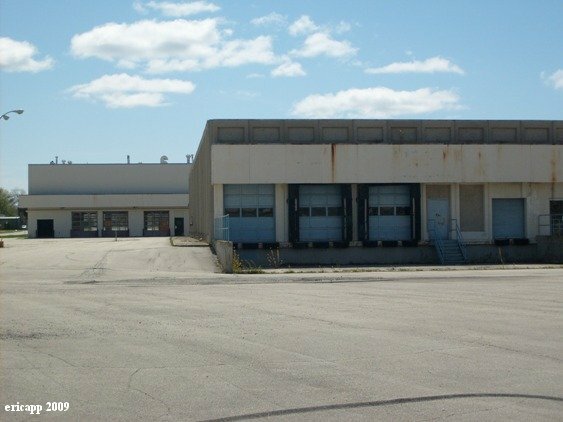 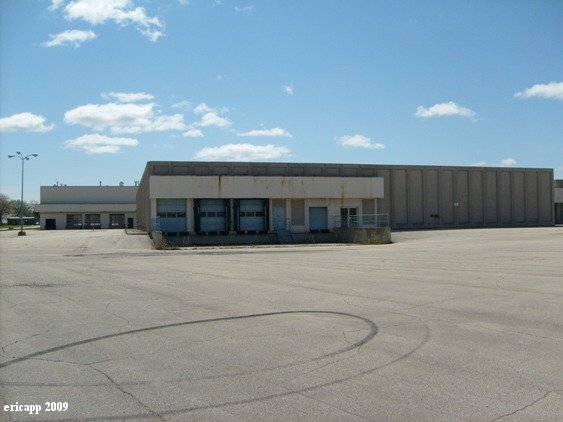 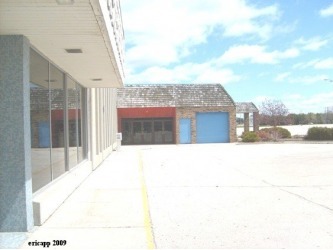 At left in both photos is the Montgomery Wards auto service center; at right is their loading dock. A look at the west side of the mall. 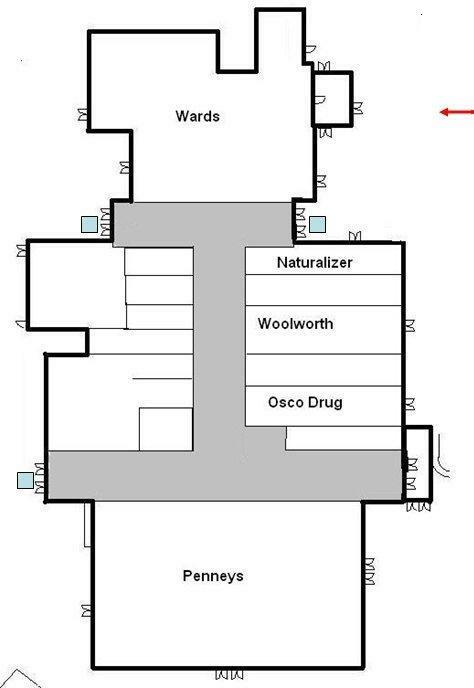 Grocery store. 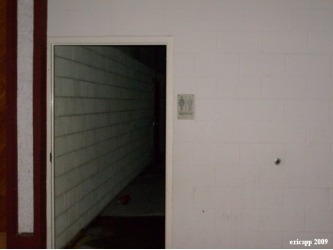 Notice the "S" label scar. One of the two main entrances on the west side of the mall. 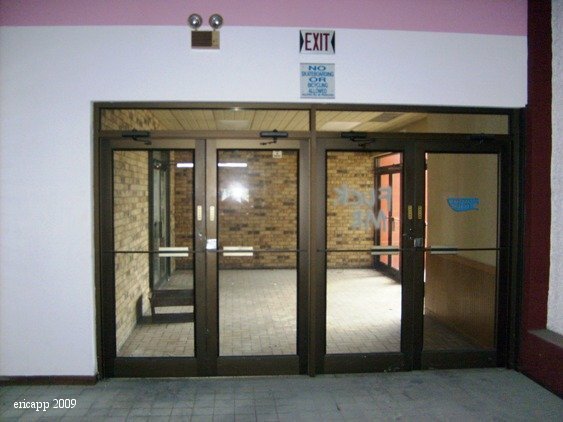 Walk up to the main entrance doors, peek inside and this is what you see. The grocery store, as seen from the west side. 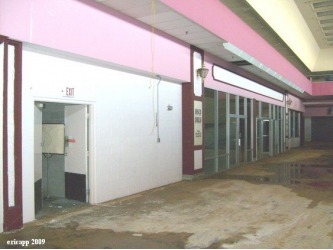 The west side of the mall. 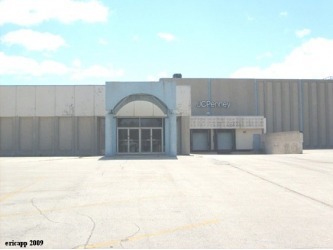 The other of the two main entrances on the west side of the mall, next to the JCPenney store. 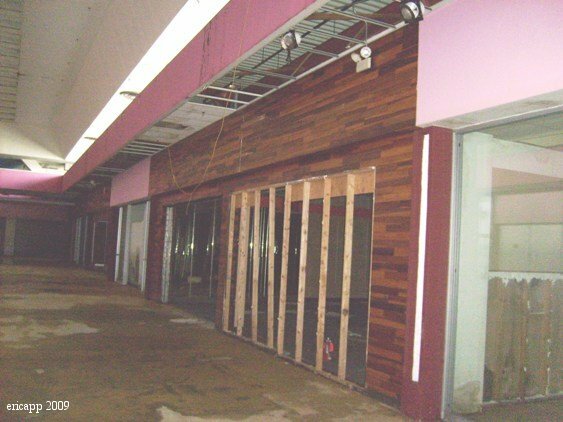 Peek inside the west-side main entrance that is next to JCPenney and this is what you see. 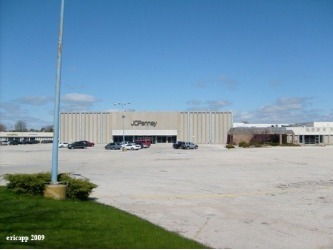 The west side of the mall and the west side of JCPenney. 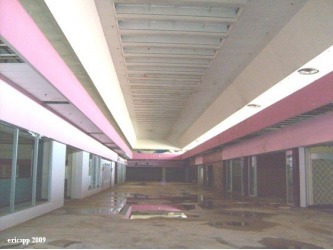 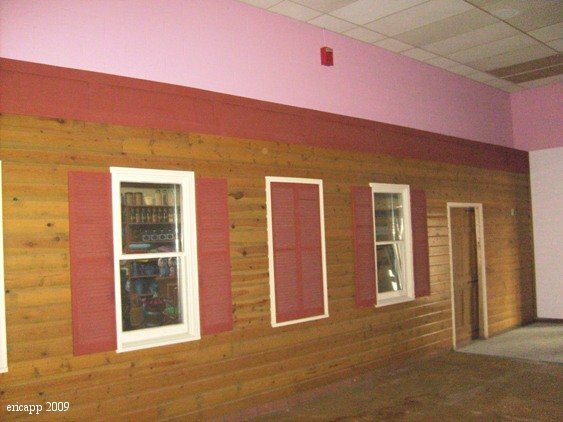 If your favorite color is pink, then you would have loved this mall! 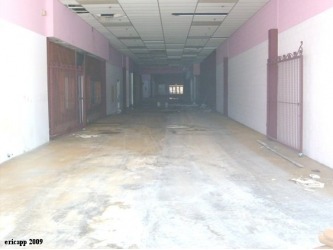 Facing south in the mall's main corridor. 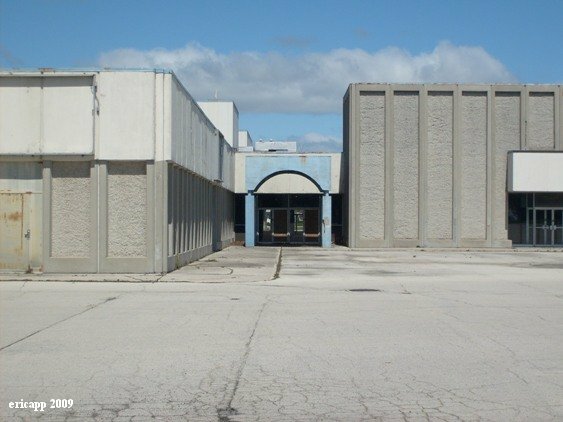 Store fronts on both sides, and JCPenney all the way down at the end. 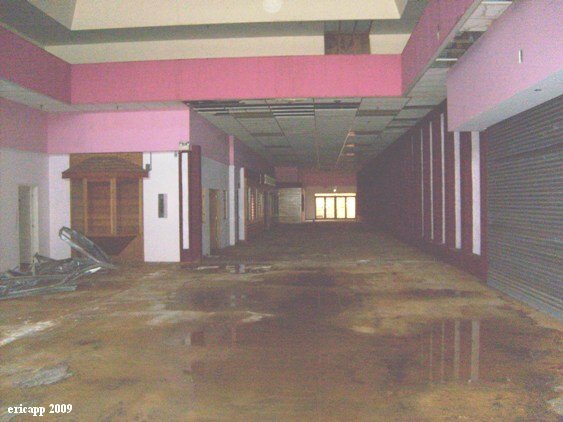 Judging by the wet floor seen here and the damaged ceiling tiles in many of the stores, it's obvious the mall's roof has a major leaking issue. Dankness fills the air. Penneys store front inside the mall. 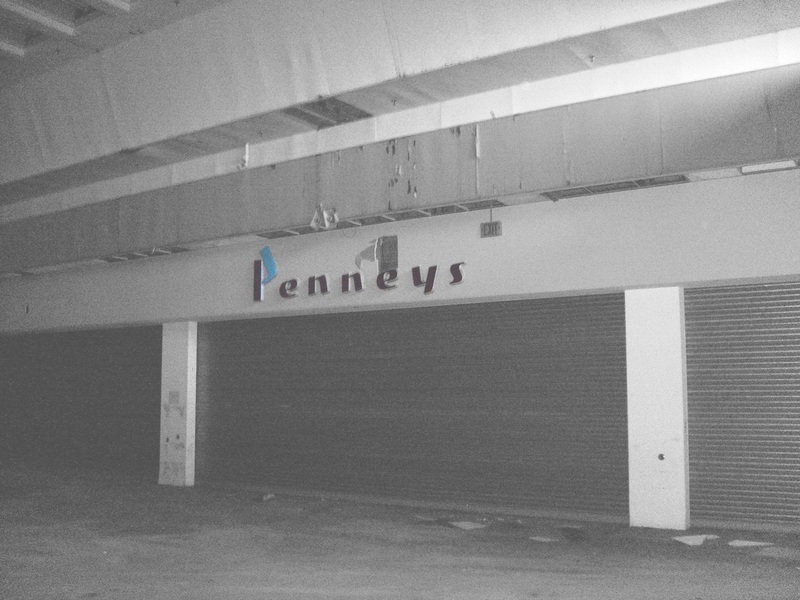 Haven't seen a Penneys sign like this in a long time. 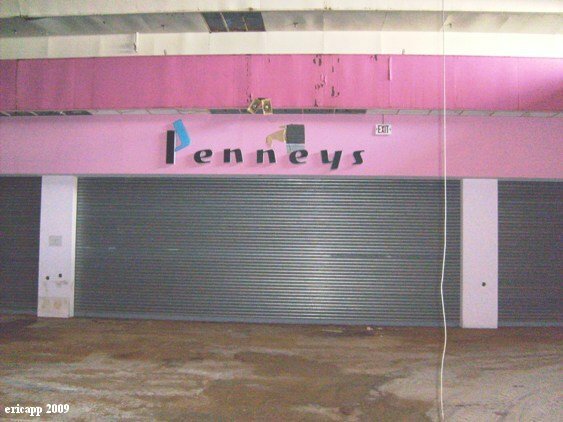 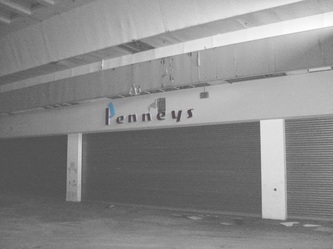 The Penneys logo shown here was used in the 1960s. 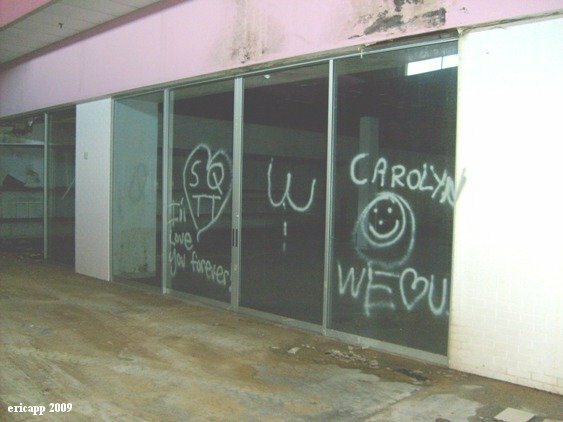 For some reason, the company updated the sign on the exterior of the building but not inside the mall. 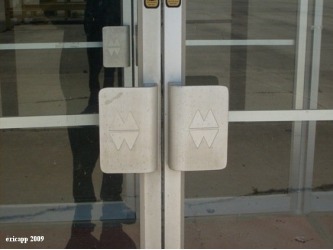 This took place at other locations, as well. 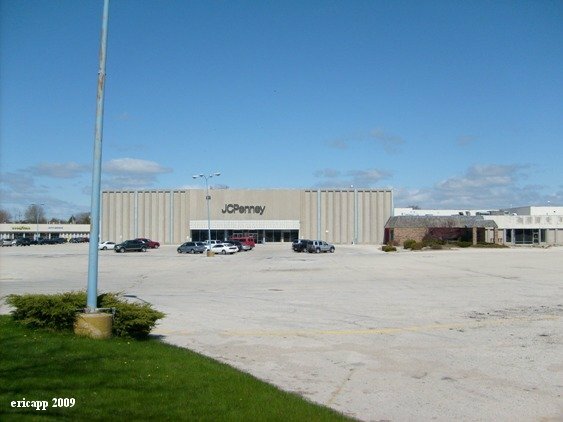 Additional research: The company's 1971 Spring/Summer Fashion catalog was the last one that I could find that used the Penneys logo (seen here) on its cover; the 1971 Fall/Winter Fashion catalog was stamped with the more-current block JCPenney. This would lead me to believe that the logo change occurred in 1971. Facing north in the mall's main corridor. 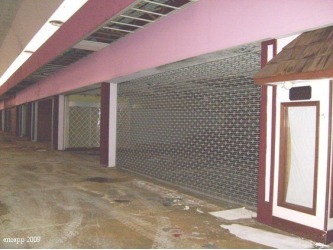 Store fronts on both sides, Montgomery Wards at the end. 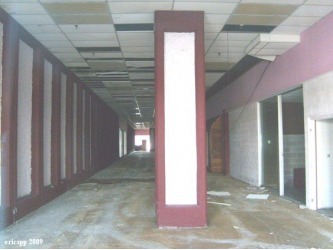 The following photos show the east side of the main corridor. Vandals spray painted the second set of glass panels of the first store, which was a shoe store. 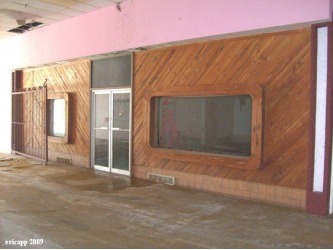 The store fronts look to be in pretty good shape. 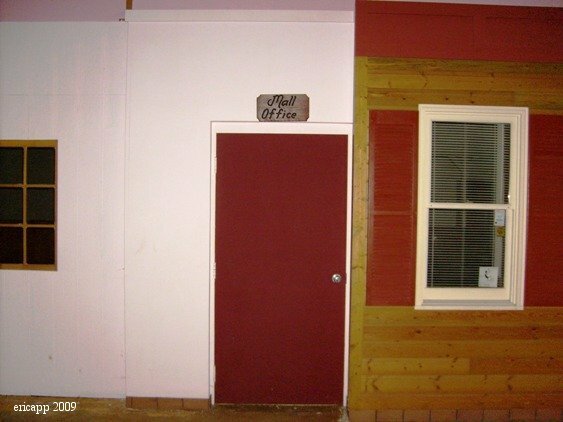 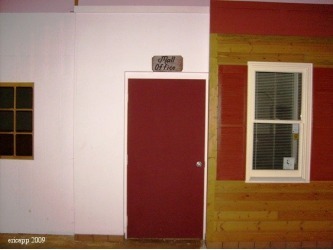 The color scheme is another story. The following photos show the west side of the main corridor. 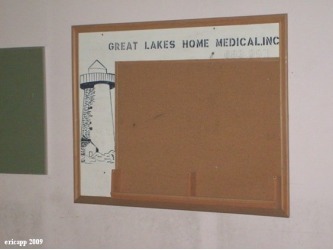 A display case or bulletin board. 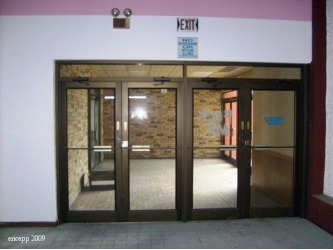 Right: the grocery store entrance. 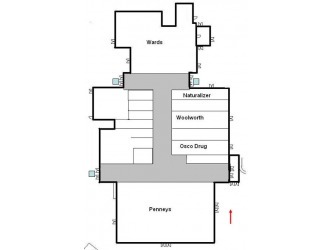 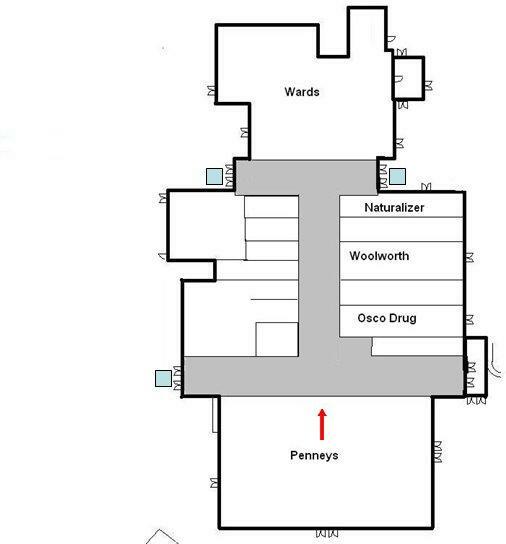 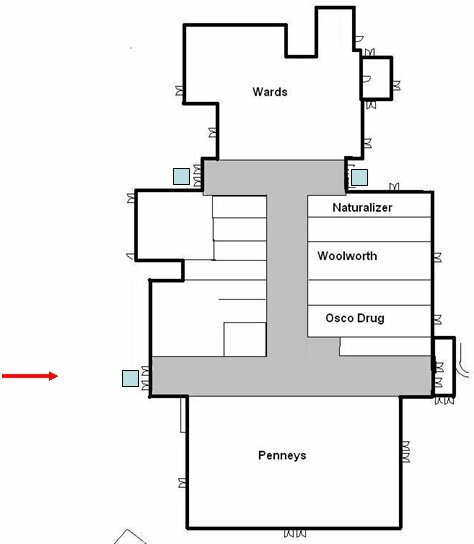 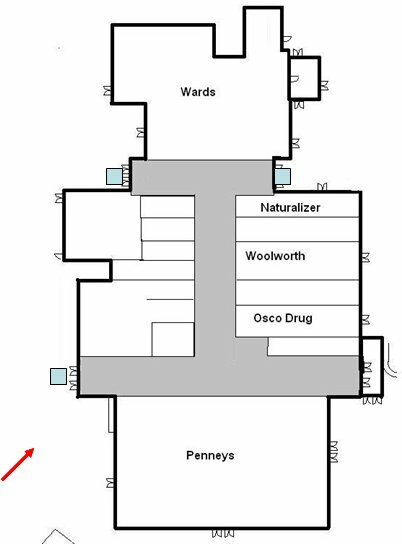 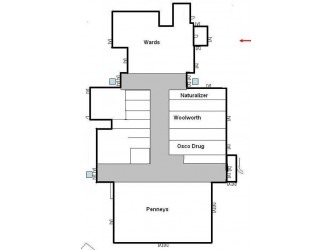 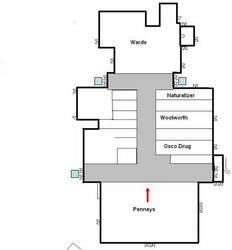 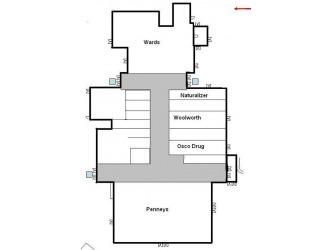 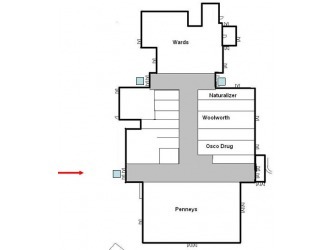 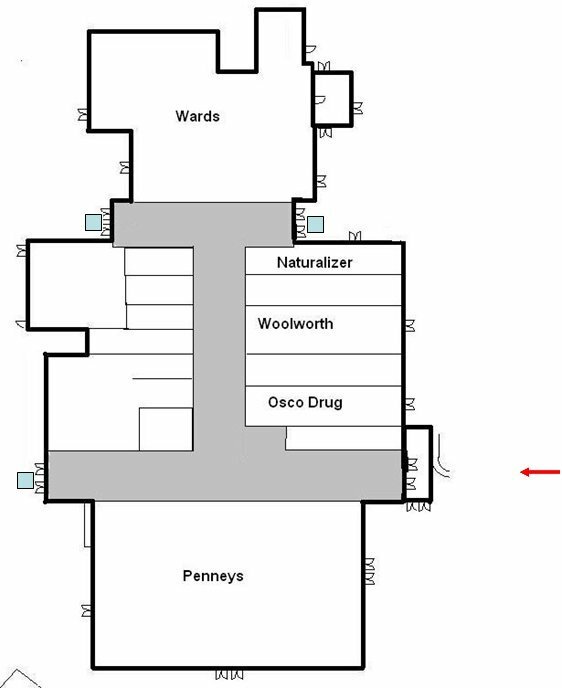 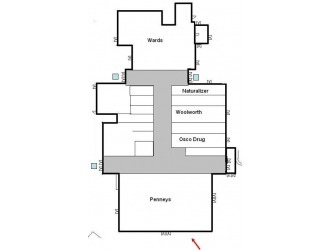 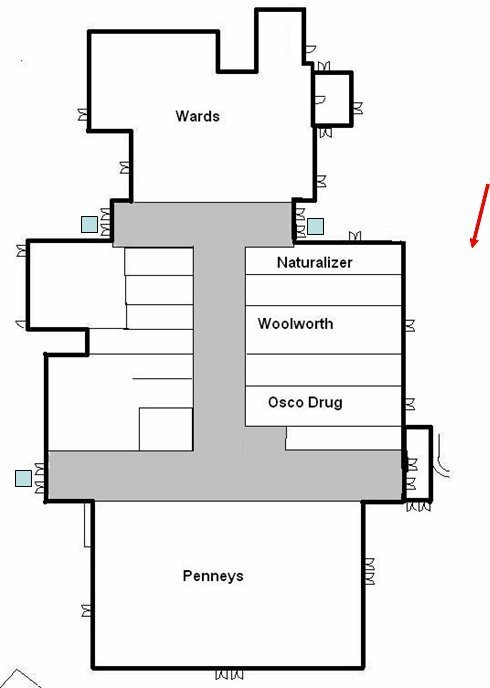 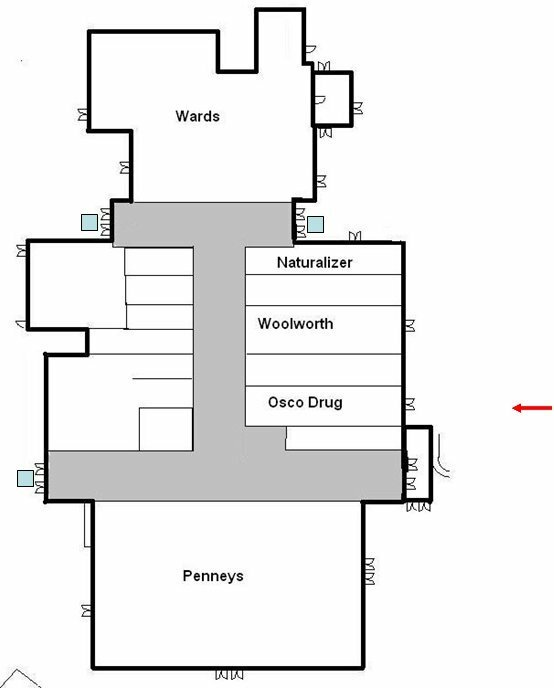 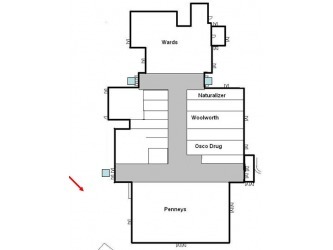 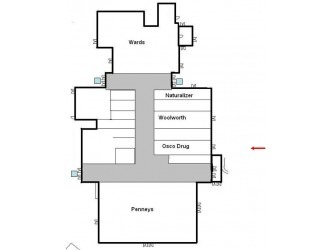 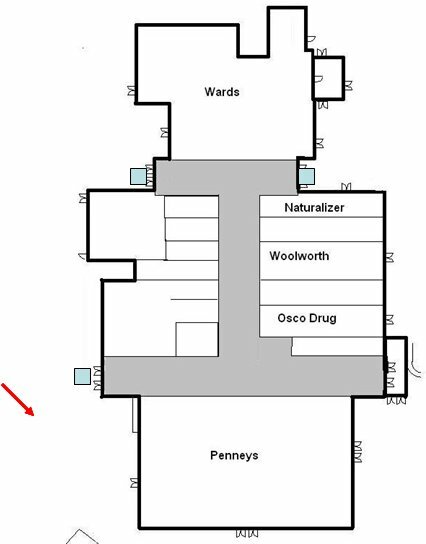 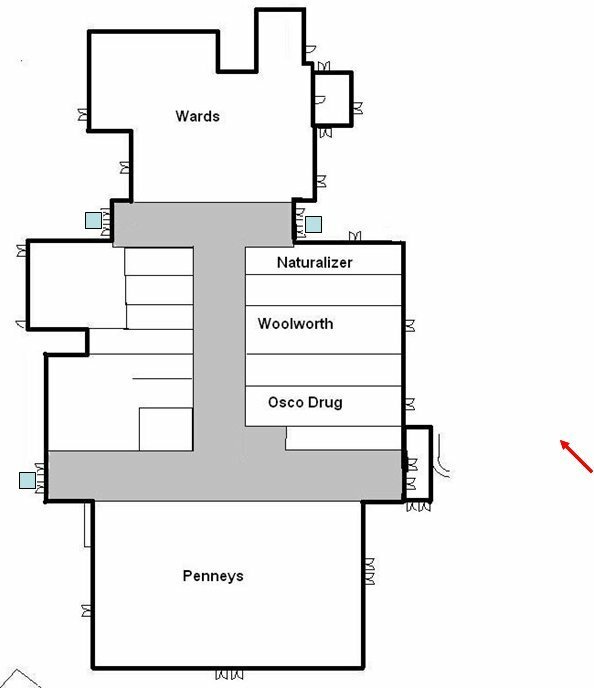 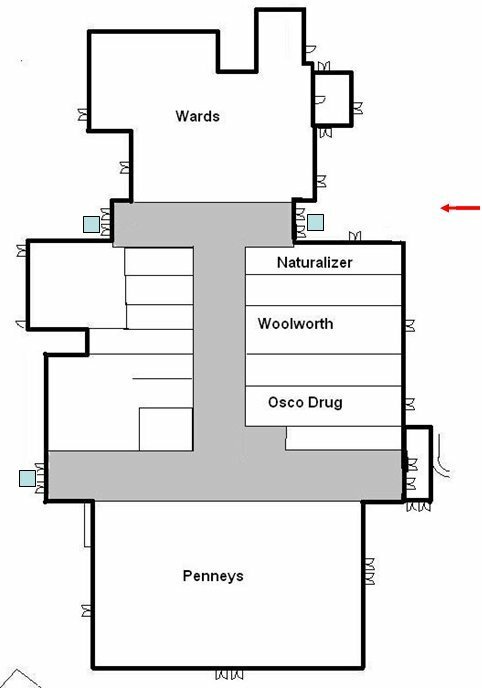 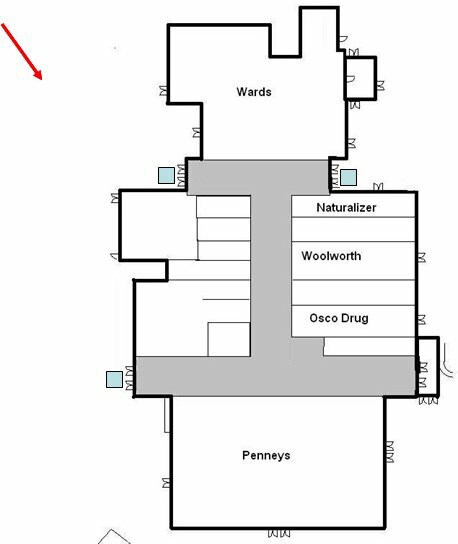 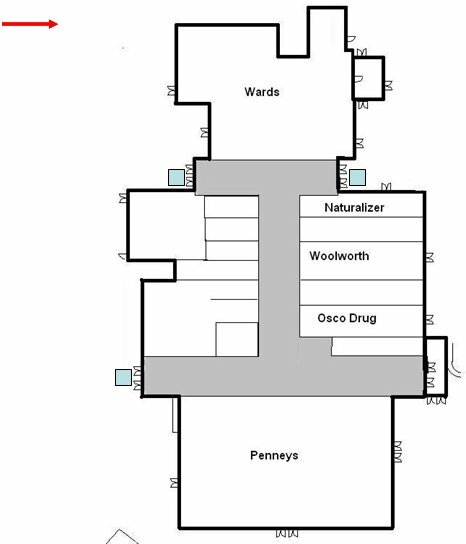 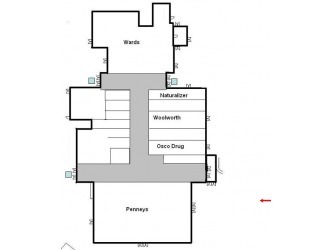 Above: This is a hallway that not only leads to the restrooms but also to the back of the stores (for employees) along the west side of the main corridor. 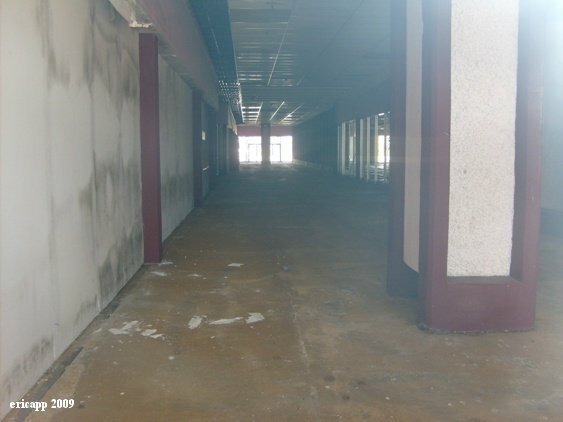 The hallway goes all the way through to the north corridor, next to the grocery store. 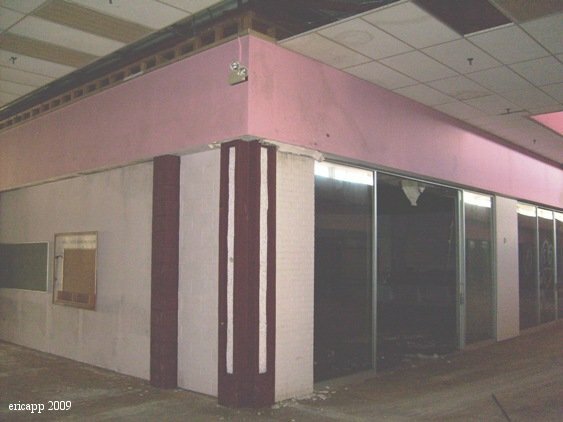 Above: The final occupant of this space was a nail salon. Inside JCPenney: The wall shown in this photo was constructed, presumably in 2000, to close off the store from the rest of the mall. The same dank odor that is very evident inside the mall is faintly noticeable in this area. 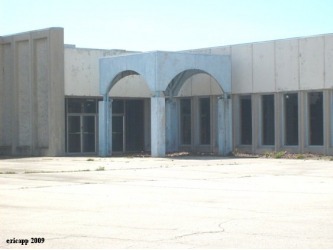 The first video is a bike ride around the mall's exterior. This video was recorded in 2010, when JCPenney was still open. The store did close in January 2011, leaving the entire mall vacant. The second video was recorded from the mall's center corridor.